3D Ketubahs - What is a 3D Ketubah? On the day of your marriage, you and your partner will commit to a life of love, partnership, and joy. These promises and the words reflected in your ketubah will remain a source of inspiration and strength for all the days of your lives. Now your ketubah can be created as a personalized 3-dimensional, museum quality piece of art that will reflect all of the happiness and hope of your wedding day. Featured on a wall in your home, it will stand as a uniquely beautiful piece of art, providing daily inspiration as well as a tangible representation of your lifelong commitment. It will eloquently represent your emotional and spiritual bond, and will become a conversation piece for you to share with family and friends. How are 3D Ketubahs created? Gabrielle creates her unique and beautiful ketubah designs using the medium of digital collage. Once the design is complete, the text of the ketubah is customized and personalized for the couple. After the text is approved (proofs are exchanged via email to the couple and Rabbi or Officiant), the production process begins. A multitude of copies of the design are printed. Gabrielle uses only high quality premium photo paper and inks. Each layer is then hand-cut, intricately trimmed and constructed by Gabrielle to create the multi-layer, 3-dimensional version of the original print. The bottom layer is trimmed to allow for an open window which will feature the ketubah text. Faux gemstones are carefully applied to the 3D design with a subtle hand to add drama and light to the art. 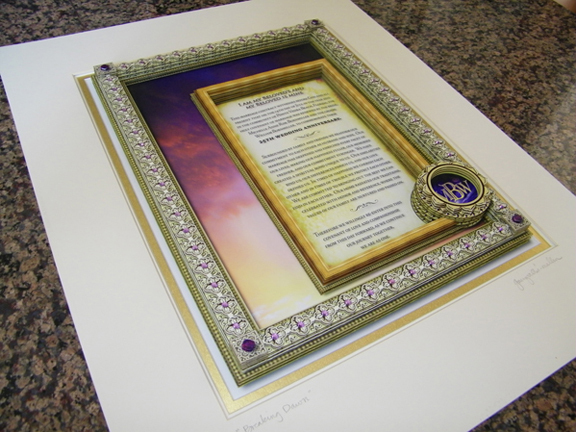 After the 3D Ketubah is constructed and double matted, it is secured within a shadowbox frame featuring UV glass. This creates an additional level of protection against fading. 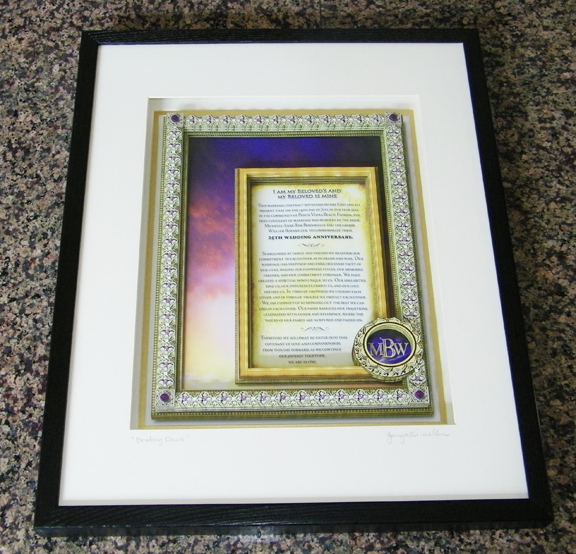 Finally, an additional matted print of the ketubah is added to the back of the frame. This removable layer is the document that will be signed by the bride, groom, witnesses and officiant. It is matted for an elegant presentation during the ketubah signing ceremony. 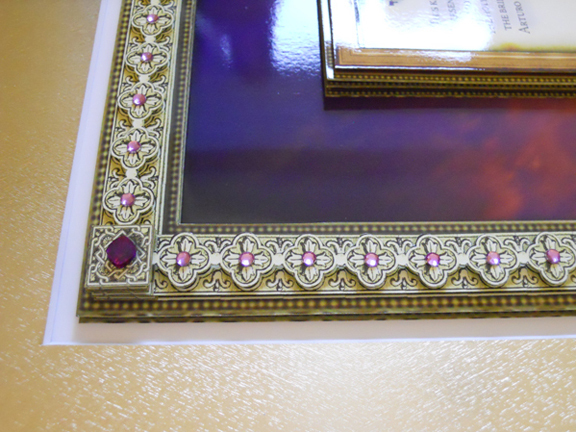 After the document is signed, it will be placed into the back of the shadowbox frame. When viewed from the front of the frame, the signed ketubah text will be visible, completing the stunning 3-dimensional design.